Brooms may be made of various solid, flexible branches, grasses and roots. Especially birch twigs, broom, juniper, willow, heather and bunt were pooled for this. (Young twigs of young birches are harvest in January.) Movies and books about Harry Potter made ​​at the turn of the century the broom popular again. Albeit rather to fly than to sweep. For indoor softer brooms were made for which as with brushes, as well false flax(Camelina (sativa)) and hair was used. Horses, pigs,... can deliver hair. The shaggy hair that adult boars wear especially above the shoulder in the winter is called brush. The production is not that difficult. Create a solid bundle of twigs (or wicker (wood)). The bundle happened earlier to be bound with willow twigs or bars young oak bark. Later, of course, with wire. This is the sweeper, ready. 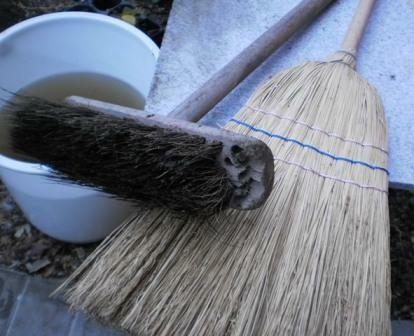 To make a broom (or scrub) knock a stem with a sharp point in the middle in the bundle. You can, as with a paint brush, hold the branches closer together by binding the beam at several places below the stem. As the twigs wear you can always remove one binder ring. Due to wear often a new broom must be made. Useful was the method by which the twigs were pressed into a ring of tire iron. Which could be reused again. A convenient broom binder made ​​more than a hundred brooms per day. Best brooms were made with the roots of Purple Moor Grass (Molinia caerulea). The breaking loose of up to 40 cm long roots was also called bunt stabbing. Purple Moor Grass grows mainly in moist, grazed heath. Except to clean long blow pipes it was also used to make Leiden pipes. Clay was rolled around the stem and so fired. During baking the straw burned. Purple Moor Grass is suitable for this because it has no knots. The moor grass was often tied in bunches and used as roofing and to make beehives. Grain farmers do not like it because ergot often occurs. The stabbing happened with iron rods as a lever with a block of wood as a focal point on the soft ground. For a brush was used a rectangular board with a number of rows of holes. A folded stitching was stabbed through each hole. In this loop a bunch of roots was stabbed. Then the wire was pulled vigorously through the hole so that the bunt was double pleated stuck in the hole. On the back was later nailed a cover slat and in there was a broomstick installed. The roots were on a chopping block cut right. Another technique consists of rows of holes in but not drilled through a block and then a staple spikes the bundles therein. During World War II hiding, Allied pilots have stabbed grass and made ​​brooms under cover. They were an unobtrusive and remote part of the population. Later, the craft was supplanted by cheap plastic brooms. The roots of purple moor were also boiled to make dishwashing brushes. Brush comes from the Germanic "burstila ': spiked hair (from pigs or hogs). A feather duster or feather brush has a stem, with at its tip feathers, plumes or very soft bristles and is used to dust furniture and objects. A manual will not really be necessary? Some rope, a twig and feathers suffice. As scouring pads to clean milk jugs and kettles was cramming heath used, but also other twigs and grasses. Ponytail would, because it contains a lot of silica, also be very suitable here. Why witches fly on a broom? Because a vacuum is too heavy. "Mother in-law, come in! You came walking or have did you taken the broom?" New brooms sweep clean but old brooms know the corners.